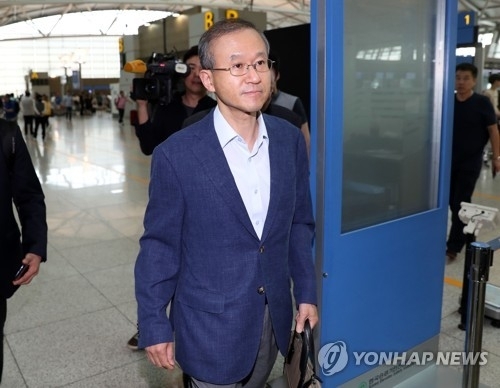 SEOUL, Aug. 27 (Yonhap) -- South Korea's vice foreign minister on Sunday left for the United States to meet with senior U.S. officials over North Korea's nuclear issue and the Seoul-Washington alliance, government officials said. Vice Foreign Minister Lim Sung-nam will meet with U.S. Deputy Secretary of State John Sullivan and other ranking officials on Monday, according to Seoul's foreign ministry. Lim will be in Washington till Tuesday. The vice foreign ministers of the allies are expected to discuss their coordinated stances toward North Korea's nuclear and missile threats. "There will be assessment over the current (security) situation and consultations on overall responses to it," Lim said before departure at the airport. Signs of de-escalating tensions somewhat emerged after exchanges of bellicose rhetoric between U.S. President Donald Trump and the North Korean leadership earlier this month. North Korea on Saturday fired what's seen as three short-range missiles following its decision to hold off on its threat to stage missile strikes near the U.S. territory of Guam. The officials are expected to discuss alliance issues including a revision on missile guidance and the timetable for holding a joint defense cooperation talks on a regular basis. Seoul earlier said that it and the U.S. have agreed to open negotiations to revise a bilateral missile guideline pact, possibly to allow South Korea to double the warhead it can place on its own ballistic missiles. The South would be able to develop a missile with a range of over 800 kilometers and a payload of 1 ton from the current 500 kilograms if the guideline is revised. "Cooperation channel at a vice foreign ministerial level will help back up higher-level communication channel between the allies," said an official at South Korea's foreign ministry. After the U.S. trip, Lim will fly to Canada for a three-day stay to hold talks with his Canadian counterpart, the government added.